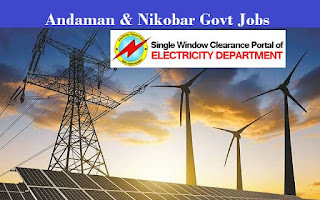 A&N Electricity Department Govt Career 2018-2019 Application Form for 32 Junior Engineer (JE) Posts Download Application through Official website www.andaman.gov.in. The last date for submission of applications is 08.03.2018. The Candidates will have to apply before carefully reading the advertisement regarding the process of examinations and interview, payment of prescribed application fee/intimation charges, Andaman-Nikobar Electricity Department Career 2018. The stipulated criteria before Applying Online. Should qualify the written professional test. (iv) Caste and attested copies of relevant documents should be addressed to “The the Assistant Director (Admn. ), Electricity Department, Andaman and Nicobar Administration, Vidyut Bhawan, Port Blair -744101” by post so as to reach us by 08.03.2018.